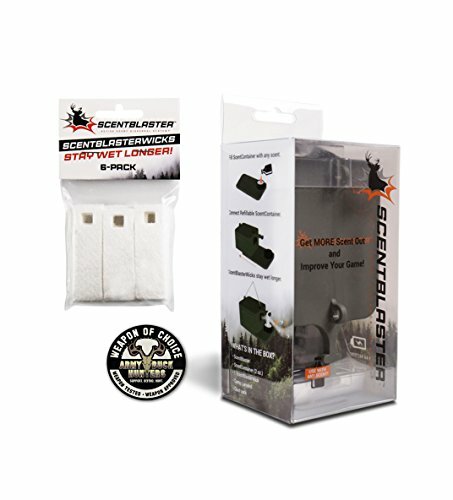 ScentBlaster is a better wicking system that increases the range and effectiveness of any hunting scent. Pour a bottle of your favorite scent in the ScentContainer and insert a ScentBlasterWick. The all natural wick stays wet, maintaining a stronger scent path and better hunting scent control. It's easy to swap or store different cover and attractant scents with interchangeable ScentContainers. Includes ScentBlaster with ScentContainer, 1 ScentBlasterWick, lanyard and cord lock and ScentBlasterWick 6-pack! Increases range and effectiveness of any deer scent or predator scent. Wick stays wet for best hunting scent control. Scent dispenser works with your favorite brand of cover scent or attractant scent. Switching and storing hunting scents is easy with interchangeable ScentContainers. Extra containers sold separately. Quiet blower fan gets scent out on calm days. Runs continuously for ~60 hours. Battery operated - 4 AA batteries not included. If you have any questions about this product by ScentBlaster, contact us by completing and submitting the form below. If you are looking for a specif part number, please include it with your message.